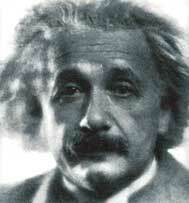 Albert Einstein (1875-1955) radically changed the way we think about the world. Einstein's special "Theory of Relativity" (1905) and "General Theory of Relativity" (1906) revolutionized scientific thinking. Ironically, when he was awarded the Noble Prize in 1921, the controversy aroused by his theories was so great that they were not specified in the text of the award. Einstein dedicated the rest of his life to his Unified Field Theory, an effort to explain the basic laws of the universe and the interconnectedness of matter, energy, gravitation, and electro-magnetism. The fruits of his great intellectual labor are evident. Though initially an unremarkable student, Einstein's interest in science was evident early on. He was introduced to geometry at age eleven and science books at age twelve. His first scientific paper, written at age sixteen, reveals that he was already developing theories that would lead to his life's work on Relativity. Kaller's owned this unique, historically significant document and exhibited it extensively. It has since been sold. Visit the links below to view other available one of a kind Einstein documents.